Newark Mayor Cory Booker's nearly 1.4 million Twitter followers now have a one-click way to help the " social media phenom" in his campaign for U.S. Senate. So, too, do supporters of Terry McAuliffe, the former Democratic National Committee chairman running for governor in Virginia. The two campaigns have started using Givver, the "first platform dedicated to fundraising with Twitter," according to its website, which allows backers to tweet dollar contributions to charitable and political causes, ranging from $3 to $250. Users must sign up for Givver before they can donate. Booker introduced Givver to his supporters June 14 by tweeting, "Help me reach $100k goal by tomorrow. You can tweet to #give $5 to our Senate campaign - sign up at givver.com/cory-booker-for-senate #Booker4Senate." "The folks at Givver reached out to us and helped us get set up just to see how it goes," said Larry Huynh, a member of Booker's digital team. "When the idea and the platform was brought to our attention, we said, 'For sure, let's give it a go.' With his huge presence on Twitter, it really made sense that we were providing folks who are supporters of Cory Booker any mechanism to support the campaign in any way they see fit," Huynh added. The Booker campaign declined to say how much money it has raised on Givver. "I think it's overall been successful because, again, it's a pretty straightforward process," Huynh said. "It doesn't require a huge infrastructure on our end and so there aren't huge fixed costs." McAuliffe hasn't tweeted about it, and his campaign's Givver activity isn't as far along. A McAuliffe representative confirmed to ABC News that the campaign has signed up to use Givver and is setting up its account. The campaigns' participation could also help Givver, a start-up founded last summer in St. Louis. 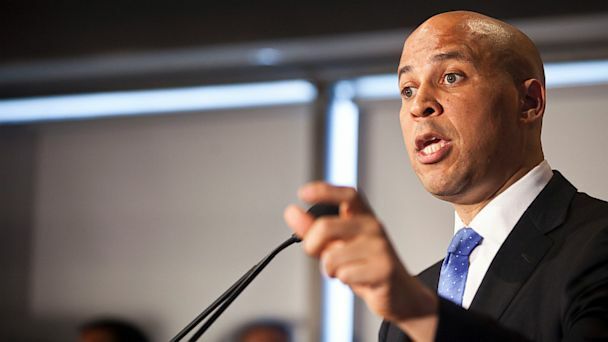 "We're honored to have Mayor Booker on because he's such a … thought leader on social media,'" Givver founder Chris Sommers said. "The next generation of donors and givers … are not writing checks with frequency and obviously not with the dollar amounts that some older people are. But, at the same time, they're actually looking for something in return." Booker has been providing that "something in return" through retweets to some of his donors. "If [Cory Booker] is tweeting to 1.4 million people … I'll tweet three bucks every few minutes if I'm into that," Sommers said. The Internet has become a major source of fundraising for political campaigns, which have used social media to direct supporters to donation pages on their websites, without taking donations directly via Twitter. As fundraising technology has advanced, campaigns have sought new ways to bring in cash. Campaigns began collecting contributions via text message last year. The Federal Election Commission OK'd that avenue for donations in the fall. Other campaigns using Givver include Rick Weiland, who's running for U.S. Senate in South Dakota and recently signed up for Givver, and Jessica Ehrlich, who's running for Congress in Florida, according to the Givver website. Obama for America used Givver as a beta test last year.